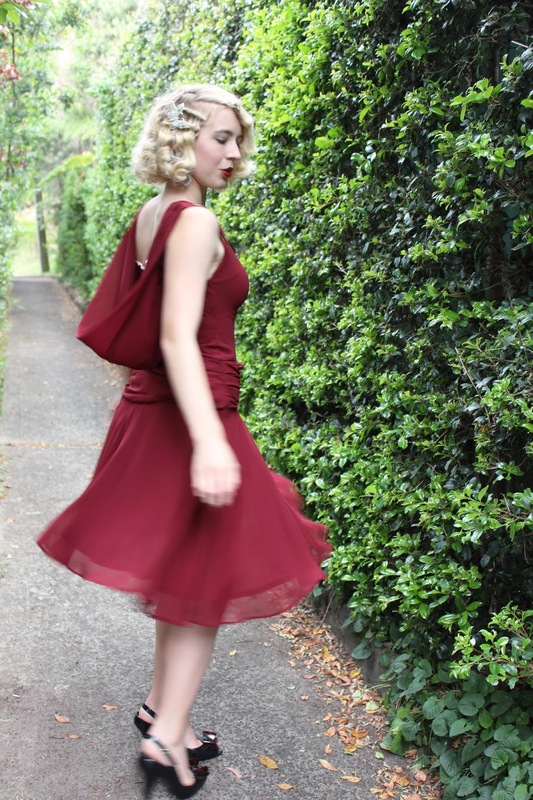 A great 20s style dress that can be worn all year round, dress it up or dress it down as it's a dream to wear either way! It's been a while since I have worn a 20s dress and I always dress depending on my mood. It feels really nice to jump back to this style as the process of creating this type of look is so much fun. I always like to do finger waves in my hair however the annoying part of this hairstyling session was that I ran out of hairspray and had to go without, wahhh! This particular day it was overcast and about to rain, I got my shots and enjoyed floating around in this beautiful dress. It would also be a great dress for Christmas parties, NYE and of course it's a wonderful dress to wear all year round. This dress is made of light chiffon fabric with beautiful beading, it's great to wear even on a hot and muggy day as it's nice and lightweight. 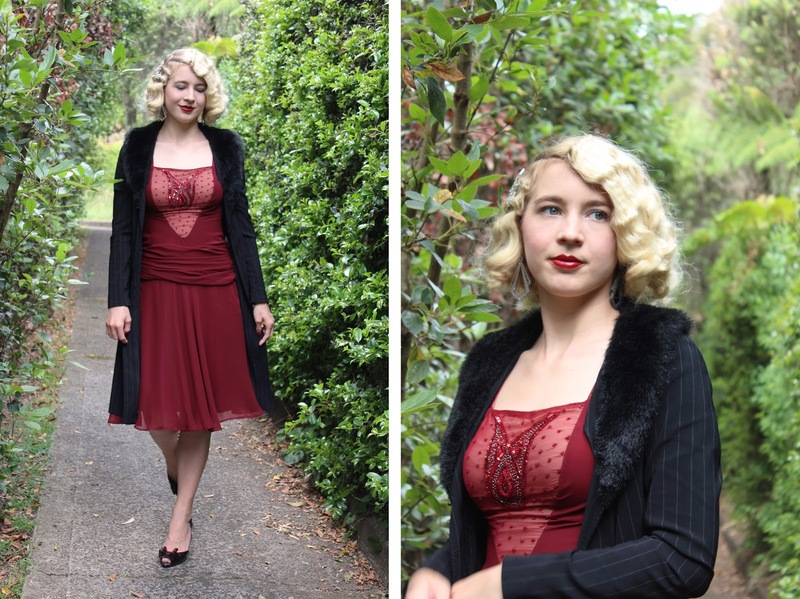 I just love how comfortable and glam this dress is, Unique Vintage brand flapper dresses are always so well made with great attention to detail. In January I wore the most amazing heavily beaded flapper dress so it was nice to try one of the lighter flapper dresses this month. 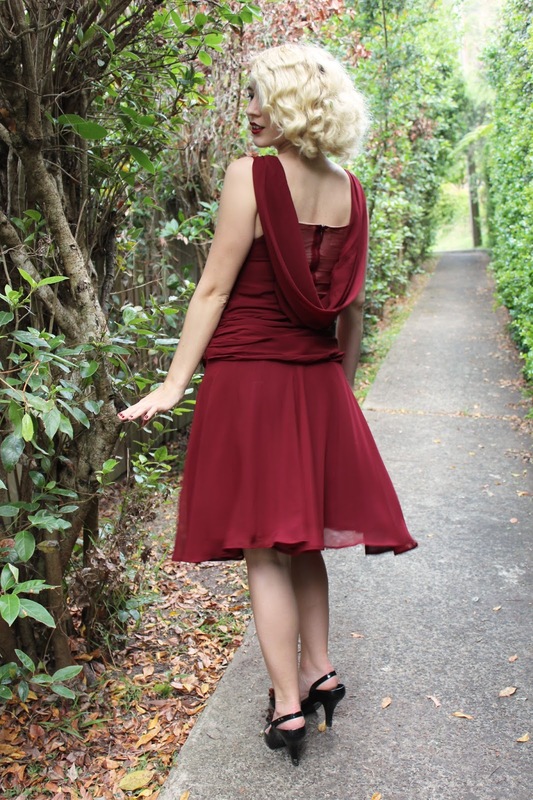 I also really love the drapping on the back of this dress and the rich burgundy colour is stunning, I squealed when I pulled it out of the box. I went with my regular size small in Unique Vintage brand clothing which fits perfectly, this dress has no stretch so if you are in between sizes it would be best to size up, just be sure to check the sizing chart. I have lots of outfits I need to blog and festive looks I want to wear + bring to the blog before it's too late... The time goes way too fast! Tonight I plan to make a coffee and catch up on my blog reading as I was away from my computer for almost a week. Oh my! Such a fantastic dress on you! Absolutely stunning Kayla! <3 Love these 20's looks on you! What a gorgeous dress! I love the draping at the back and that gorgeous color, and the fit of the dress is really great on you - not too boxy, but still perfectly 20s inspired. Definitely a piece to pull out any time of the year! Stunning dress! You look beautiful!